The plaque is on the south wall of the chancel. The Gas Standards are missing. A biography of Captain John Mason appears on our sister site History In Portsmouth. Here we shall concentrate on the memorial itself. In the summer of 1874 a Mr. John S. Jenness was visiting England from his native New Hampsire and one of his objectives was to collect information relating to Captain John Mason who was recognised by the residents of that state as their founding father. Jenness was working at the behest of Charles Wesley Tuttle who had been commissioned by the Prince Society to write a Monograph on John Mason. Both Jenness and Tuttle knew that a crucial part of the story lay in Portsmouth where Mason had lived for much of the latter part of his life and so Jenness headed there. 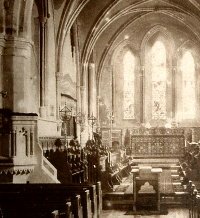 He arrived during the later stages of the restoration of the Garrison Chapel (now known as the Royal Garrison Church) and introduced himself to the Venerable Archdeacon Henry Press Wright the Senior Chaplain to the army who was deeply involved in the restoration. On being told of Jenness's quest Wright spotted an opportunity to bolster the prestige of the church whilst at the same time helping to pay for the extensive work which still needed to be done at the church. 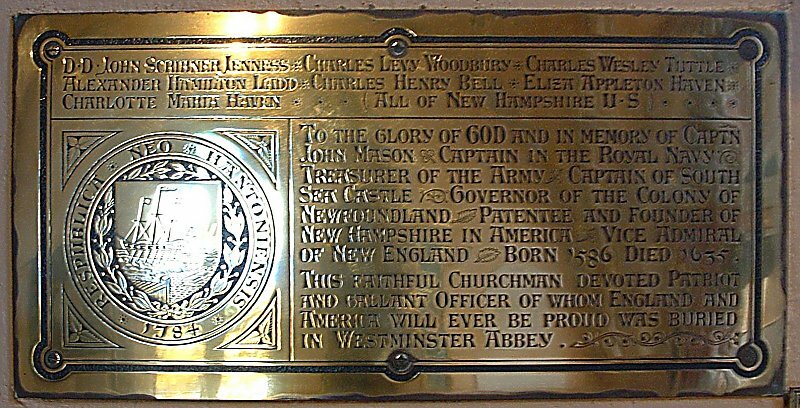 He proposed to Jenness that he should write to the Governor of New Hampshire, James A. Weston, suggesting that the residents of that former colony may be prepared to pay for the erection of a memorial to commemorate the unity between old and new Hampshire as personified by Captain John Mason who regularly worshipped in the Chapel. Wright went on to suggest that the memorial should be in the form of a plaque and four gas standards and estimated that the combined cost would be around �0 (equivalent to about �,500 in 2012). The letter was received by The Hon. Charles H. Bell, a later governor, who then composed a response to be published in the "Exeter News Letter" on November 27th 1874 in which he supported Wright's proposal and invited interested parties to pledge the neccessary funds. The Governor, James A. Weston, took up the baton and with the help of John Jenness collected the proposed amount from the small group of patrons who are named on the plaque. Of these we have already met John Scribner Jenness, Charles Wesley Tuttle and Charles Henry Bell but the others also have very apposite reasons for contributing. Alexander Hamilton Ladd, Eliza Appleton Haven and Charlotte Maria Haven were all descendants of Captain Mason, being great-grandchildren of Col. Tufton Mason from whom the Masonian proprietors purchased their rights in New Hampshire. A full transcript of the correspondence conducted in this matter is available for download here. The whereabouts of the gas standards is unknown though their original location can be seen in the photograph of the church (above left) probably dating to before the Great War. They were positioned between the front and rear sets of choir pews in the chancel, the holes that were made to take them can still be identified, though now they are filled in with wooden inserts. Presumably they became redundant once the church was converted for the use of electricity. Although the plaque states that Mason was buried at Westminster Abbey which is where he wished to be interred the authorities there have been unable to locate any documentary evidence that it happened. The main researcher for Charles Wesley Tuttle was by name Colonel Chester and he wrote to Tuttle to say that the lack of evidence was not in itself surprising and that there was good reason to believe that Mason was indeed buried at the Abbey. Chester supports this theory by pointing out that Mason was buried only a very few years before the outbreak of the Civil War and before several members of Oliver Cromwell's family were also buried at the Abbey. The register of deaths for this period was mutilated after the Restoration in order to remove all evidence of the Cromwells whose bodies were all disinterred. Chester supposes that the persons mutilating the record were not too fastidious about the names removed as long as they included the Cromwells and this may be the reason that Mason's name does not appear. Colonel Chester went on to report that the Probate Book for London includes an entry for Mason in which he is described as 'of the City of Westminster'. In such cases it would surely be appropriate for the testator to be buried in the same parish and there were only two other churches in Westminster - St. Margaret's and St Martin's-in-the-Fields, neither of which has a record of Mason's burial. This leaves only the Abbey. 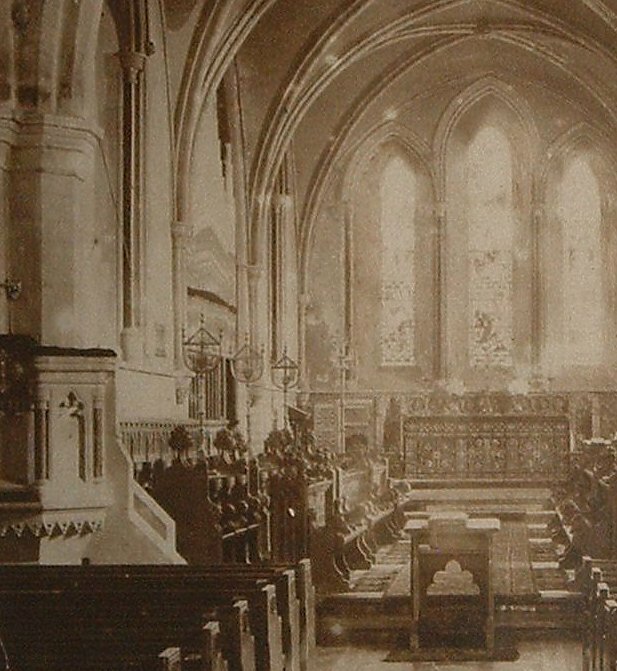 There is no record of the exact date when the plaque in the Garrison Church was unveiled but it may have been in 1877. The logic for picking this date is that a century later in 1977 some of the Piscataqua Pioneers from New Hampshire donated an almost identically worded memorial plaque to the Cathedral of St. Thomas's in High Street. A suitable moment for doing so may have been the centenary of the unveiling of the original plaque. Although there is no known direct connection between Mason and the original parish church (now the Cathedral) his plaque does sit very near to the memorial to the Duke of Buckingham who was assassinated in Mason's house further up the High Street. This may have been association enough.